Ultrasound technology is an essential medical diagnostic tool. But the monitors and peripheral devices are large, heavy, and expensive. That means that smaller practices and remote hospitals are often unable to utilize the ultrasound tool. 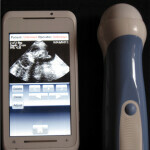 MobiUS is a new app that will turn your smartphone into a portable ultrasound machine. "These systems are affordable enough that each of our clinics in rural eastern Washington could have one, which means we won't have to send our patients to facilities many hours away," said Greg Brandenburg, CEO of Columbia Basin Health Association in Othello, WA. The MobiUS merely requires a wand, some gel, and your smartphone. For the time being, the MobiUS system only works with the Windows Mobile OS, but it will surely be adapted to other systems. Because the ultrasound images are already being transmitted to a smartphone, they can easily be shared with other clinicians via email. The only potential downside is that a smartphone will present a smaller, less clear ultrasound image. But, when combined with a tablet, MobiUS could prove an indispensable tool for remote medical practices.